View of the new Customs House, which was designed by architect David Laing in the classical style and built between 1813-1817. This print was taken from reducing a drawing by David Laing. The old customs house was destroyed by fire in 1814. A customs house was where the monarch levied customs duty, a tax on good entering the country. 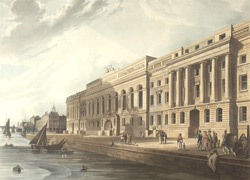 As London was a large port city, with a rich trade from all over the world, the customs house was especially important. There had been a customs house in London since 1275, but it was rebuilt many times, including by Christopher Wren after the Great Fire of London in1666, although this was damaged in 1714 by a gunpowder explosion and rebuilt by Thomas Ripley on Wren's foundations..